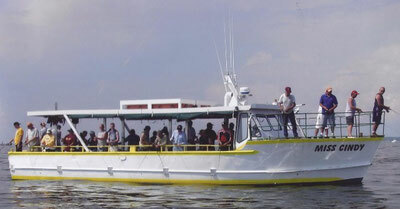 We have Walk-On Headboats, Party Boats and Private Charter Boats Available. Click on our reservations tab to book your trip today! Our Head Boats have been family owned and operated since 1979 by native professional fishing guides. Our Captains and Boats are United States Coast Guard Licensed and inspected annually. MAKE YOUR RESERVATIONS ON-LINE ! When fishing on a walk on charter the customer is provided the boat, Captain, First Mate, and a cooler for their fish. We do not provide tackle or rods. Rental Rods and tackle are available at our store for any trip for a small fee. Perch Fishing price is your ticket price plus bait ticket price. When planning a private charter with advanced notice we'll make arrangements to have your boat stocked with beer, pop, bait, and box lunches and rental rods at an included charter price. 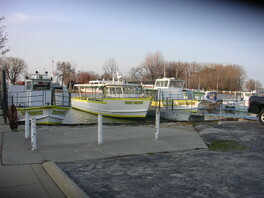 The Western Basin of Lake Erie's shallow waters attract huge schools of walleye roaming the south-central area. In March, hundreds of anglers seek pre-spawn walleye. Throughout April, the beaches and reefs northwest of Port Clinton become active as walleye cruise the shallow, sandy bottoms looking for bait fish. Casting bright-colored jigs tipped with minnows are favorite methods for catching some of the year's biggest fish. May sends walleye into deeper water around the reefs and islands. Often ignored by those but the most seasoned pros, the Western Basin's July and August harvests produce the fastest walleye fishing of the year. It's a baffling trend, but the Western Basin catch-rate (another term for the number of walleye landed per hour) is higher in July than any other month. The average walleye catch-rate during July and August is more than 30% higher in the lake's Western Basin than from the deeper waters making up the Central Basin. More than 90% of the summer catch is taken on weight-forward spinners tipped with worms as anglers cast from drifting boats such as Irish Drifter, Miss Cindy and Waterfox.